We are profoundly disappointed in the decision of the Government of Israel to deny the Jewishness of Israeli citizens not converted under the authority of the chief rabbinate, and its refusal to honor its commitment to uphold the right of Jews to pray at the Kotel as they do in their own synagogues. These decisions deliver a divisive and insulting blow to the millions of Jews who passionately believe in Jewish pluralism. By implementing its agreement, relations between Diaspora Jews and the State of Israel would have improved. Sadly, the Government violated the trust between us by changing the rules of conversion. We are currently in Jerusalem attending the board meeting of the Jewish Agency for Israel (JAFI) as Progressive Judaism’s international representatives. 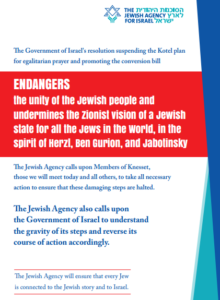 This morning, the board passed a resolution calling on Knesset members to reverse these decisions of the Cabinet. In protest, JAFI also cancelled our scheduled meeting with Prime Minister Netanyahu. The sacred civil right “to live as free people in our land” has been sold to maintain a weak political coalition. The unity of the Jewish people, a central pillar of Zionism, has been seriously harmed by yesterday’s decisions. With our movement partners in Israel, we must commit ourselves anew to defend religious rights in Israel. We urge you to contact your local Israel representatives, ambassadors or counsel general to express your outrage. We will not allow others to tell us how to live as Jews. Write, call, meet with your local Israeli Consulate. Demand the Israeli Government reinstate their promises. Keep Israel and the Western Wall accessible to all Jews. Follow this link to find the embassy or representative offices closest to you. The Israel Movement for Reform and Progressive Judaism in Israel put out this helpful resource for understanding the issues at stake. Follow them on Facebook for more updates, including from the July 1, Saturday night’s Havdallah and Protest event to be held outside the Prime Minister’s office in Jerusalem. Please fill out this form to share "The World Union Responds: Israeli Government Reneges Conversion Bill and Kotel for all Jews" via e-mail.